The afternoon was rainy and beautiful, perfect for writing. I made myself a cup of tea and a plate of cheese, crackers, yogurt and apples and went upstairs to my writing room. I stood in front of the door and stared at it. I couldn't manage to open it. My hands were full. With all the best intentions, many times we come carrying too much. We want to learn, but we come knowing too much. We want to see people for who they are, but we come judging. We want to help, but we come with our own intentions. We want to understand, but we come with too many spoken words. We want to enjoy life, but we come full of ourselves. We want to love, but we come full of doubts. If we empty ourselves of expectations, our own ideas, our wants and, more importantly, our egos, we empty ourselves to receive. We are less preocuppied with ourselves and available to help, serve and think creatively. The best we can offer is our emptiness and our willingness. 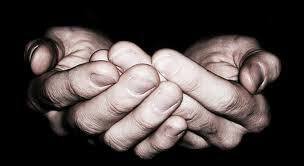 With our hands empty, we can open doors, hold each other and receive what life and love offer us.